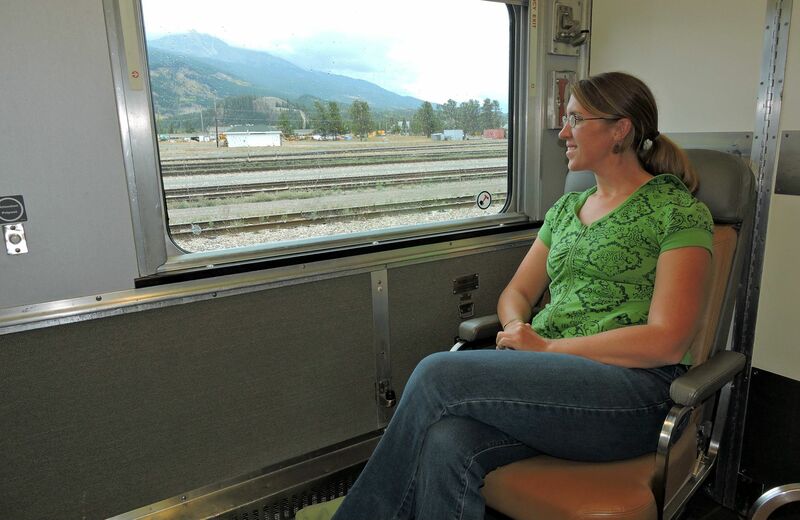 What’s it like riding a VIA Rail train through the world famous Canadian Rockies? Come along on my first ever trip! I never believed it would be like this. I felt it from the moment I stepped into the station and saw the big, long wooden benches and high ceilings with architectural details. I felt it as I sat looking at her, waiting for our time to depart. And I certainly felt it as I walked almost the entire length of her before getting to our particular car. And I knew this was going to be a great first experience on the train. My husband grew up riding the train for days on family holidays. He had so much he wanted to tell me in preparation for our VIA Rail trip to Jasper, but I was adamant that I wanted to know next to nothing about what was coming up. He tried to show me pictures. I declined. He wanted me to see a video, I said no. I knew deep down this trip was going to be fantastic, and I was going to do everything I could to experience it all without any preconceived notions of what it would be like. So when I walked up the steps of the train for the first time, I felt like a kid discovering something new. The hallways were long and exceptionally narrow, just wide enough to pull my suitcase behind me. The doors to the rooms looked much like an airplane bathroom door, narrow and swinging into the room. And some rooms just had a big, heavy curtain separating hallway from sleeping quarters. However, the night before we left I suddenly had many questions. Is there electricity on the train? Do we share a bathroom with everyone else? Clearly, my mind was racing. Jay just laughed and only answered the questions that were necessary, knowing I still didn’t want to know too much. We opened the door to our room to discover a small sink, one-piece bathroom and two chairs. Everything small and compact, yet functional. But don’t expect the luxury of a cruise ship or hotel. I was so confused, though. Where was the bed? I thought we would be sleeping in here? Jay informed me the bed(s) would appear later that evening. 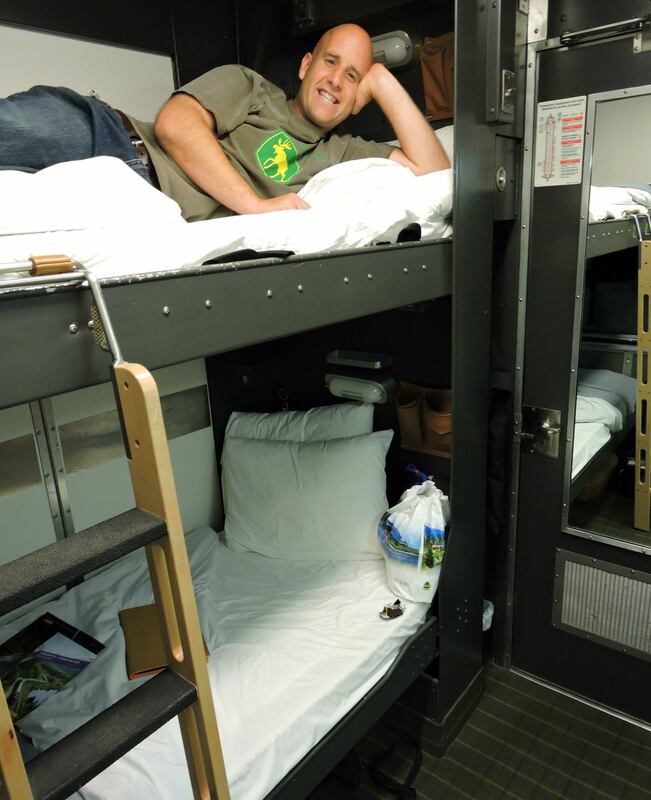 Our train car attendant would come in and pull one bed from the wall and the other from the ceiling, giving us bunk beds for the night! What an adventure! After depositing our things, we explored the train. We walked up and down the halls from car to car in giddy excitement. As Jay’s mind was flooded with childhood memories returning, mine was just trying to take it all in for the first time. We made our way two cars forward to the dome/activity car. I had heard about this one with an upper section that sits above the rest of the train with windows completely encasing it so we can see the sky and all around. I really enjoyed this seat on the train. It was such a beautiful view and nice spot to meet new friends. As we departed the station, there were no announcements telling us to buckle our seat belts or keep our chairs in the upright position. No demo on where the nearest exits are or how to safely put on our oxygen masks. No one was grumpy. Not a single person. Everyone was friendly and happy to be on the train. This is where I had my first “aha” moment. Every mode of transportation I have ever used, the purpose of it is to get to the destination. The train, however is different. The train IS the destination. So yes, we were on our way to Jasper, but we were already experiencing one of the best parts of our vacation. And it showed in how people treated one another. After making some new friends in the dome car, we returned to our room to call it a night. While we were exploring, our room was changed from sitting room to bedroom. We entered to see our bunk beds made and turned down for the night, complete with a chocolate on the pillow. Though small, the room was quite comfortable and as I bedded down in my cozy bottom bunk, I drifted off to sleep to the gentle rocking and hum of the train. The morning brought more new experiences after a hot shower, yes a shower! We headed to the dining car to enjoy a fantastic breakfast and more new company. We met a lovely couple from Australia and while we ate, we enjoyed looking out the window at the ever-changing landscape. The food was incredible. We ordered from a menu and enjoyed culinary excellence. Omelettes with feta and crab for breakfast and duck (duck!) for dinner. This train has exceptional food! Normally after a meal, there is a sense of needing to head off to the next thing. However, the beauty of the train is there really is no next thing. This IS the thing. So sit, enjoy the company and the ever-changing views, and only leave when you’re ready. It was wonderful. Jay had so much more he wanted to show me, so once fully satisfied, we left the dining car for some more exploring. What I didn’t realize before was that being in sleeper class means we could walk the entire length of the train. So we decided to stretch our legs a bit and see the rest. Thirty plus cars takes awhile to walk, but in exploring more we discovered our absolute favourite place to relax. Upon entering the Panorama Car, I gasped in amazement of the floor to ceiling windows with the Canadian Rockies in all its spender. This car has rows of seating, some seats turned around to form a conversation area, but it was the complete wall and ceiling of windows that makes this car stand out from all the rest. It was in this car we saw moose enjoying a meal. This car where I saw the highest peak in the Canadian Rockies. This Panorama car where I sat in awe of the mountains with a river canyon flowing through it. It was nothing short of breathtaking. Knowing I was going to be on a long train ride I brought a book to help pass the time, only I realized I actually never opened the pages. There was no need. I spent the entire time either in very enjoyable conversation with people from all over the world, or in awe looking out at the spectacular views of western Canada. All my experiences on VIA Rail were only enhanced by the fact that I got to share them with my husband. Though we could have brought our children, we would have had an entirely different holiday. Traveling with my best friend, my partner, my husband was by far the best choice. It was a trip of a lifetime and so very special. If you’ve never been on VIA Rail in Canada, consider adding it to your wish list of special getaways. You won’t be disappointed in your choice. If you follow in our footsteps and take a Canadian Rockies train trip from Vancouver to Jasper, may we recommend staying at Best Western Jasper Inn & Suites. We stayed in their Maligne Suite and took the next VIA Rail train back to Vancouver two days later. The suite was exceptional. Excellent dining and on-site amenities as well including a large pool, sauna, steam room and hot tub. The Jasper Sky Tram is a must do activity! We also enjoyed the Glacier Skywalk and Columbia Ice-Field Glacier Adventure with Brewster Travel. Bonus! 7 tips for first time VIA Rail train travellers! 1. Always check www.viarail.ca for the latest promotions, specials and discounts. They even have trips up to 50% off during select seasons. The train can be a bit cool at times, so dress accordingly. I’d even take my slippers next time to just aid in the cozy feeling. 3. If you are a lighter sleeper, bring earplugs. The sounds change a fair bit through the night depending on if you’re passing a building, another train, or just landscape. 4. Don’t be afraid to say hello. People are all in a good mood on the train (for the most part) and you will probably surprise yourself in making a new friend. There is plenty of it on the train. And good food at that! There is always fresh fruit, coffee/tea, and cookies/biscuits available for munching and the meals are incredibly tasty! 6. Bring extra batteries and/or your charger. You’ll be using your camera a lot and you won’t want to miss out on something. There are outlets throughout the train. 7. When catching the train at a mid-point in the west-east line, it is normal for the train to be late. There are many stops across Canada and VIA Rail yields to freight trains so it can be even several hours behind schedule. If you are scheduling anything at your ending city, be sure to leave a lot of time on the other end. For example, it’s best to schedule a flight on the following day. Got questions? CONTACT US and we would be happy to help plan your trip! We really would! Jasper SkyTram Takes Us To The Top Of The Canadian Rockies! Interesting Footwear Choice For A Canadian Rockies Glacier Walk! Glacier SkyWalk • Nothing but glass and a 918 ft drop!